I work to travel; when I travel I take my bike; when I take my bike I use it to travel! I suppose that part of this comes from the long winter we have where I live in northern Ontario, Canada. Don't get me wrong, I LOVE my country and where I live, but I have seen snow fall in each month of the year, so it is nice to get away for a "real" holiday at times. I can remember enjoying riding tricycles when I was a wee boy. This continued as I went to my first "two-wheeler" when I was 7 to my first coaster bike with 27" wheels when I was 12, and did my first long-distance ride (a mere 30 km). Things only got better. ALL through secondary school I rode my bike everywhere and did not even get my driver's licence until I "had" to when I was 18. IN my first years of university in London, Ontario, at the University of Western Ontario, I got this zany idea that I'd like to combine this joy of riding with my goal of traveling to the UK. In April/May 1986 this materialized. My sport touring Raleigh (which I have re-built and still use regularly) was my trusty steed, and for six pleasure-filled weeks, I cycled though England, Scotland and Wales. Of course, all of this was new to me, yet despite pushing too hard uphill and injuring my Achilles tendon, insufficient low gearing and a bargain rack for my panniers which needed continual tightening so it would not fall off, I WAS BITTEN BY THE BUG! Now I find that every trip I make without a bike, I am yearning to hop on two wheels and go. SINCE that fateful first trip, I have since cycled around Ireland, through France, around Maui and Oahu, and through the Canadian Rockies, not to mention many parts of my home province of Ontario, Canada, and in 2003, a trip from the eastern edge of Europe to its furthest westernmost point of continental Europe. In 2009 I compromised with my newly-cycling wife to stay at a resort in Cuba but to bring our bikes to travel the area around the resort. It was great but the trip just fueled my desire to do a 'real' tour in western Cuba. At least a part of this was realized in April 2010 when we cycled from Playa Jibacoa westward as far as Soroa before my clumsy pool-side incident ended the cycling for the trip. All year long my failure to complete the trip drove me crazy until we finally returned to do the rest of the ride from Soroa to Vinales in April 2011. Yes, it would be nice to cycle elsewhere in Cuba as well, but I think there are other countries in the world to be discovered. TO top off the 2011 cycling, a friend invited me to join him along with another friend in riding along the Danube from Vienna to Budapest. The scene was set! So the question was... which bike to bring? The airline wanted to charge hundreds of dollars to carry my bike so I rented a bike out of Vienna. It was so discouraging to be without my own bike that when I got home I bought a folding Dahon Speed TR for my next trip, wherever it may be. BEING lucky enough to be able to follow my dreams, I have accelerated my touring these recent years. A reuniting of sorts in 2014 with the guys from three years ago - this time from Zurich eastward through Bavaria and ending in Mozart's city. The following year, 2015, was a big one for me, so not only did I do a solo tour from Madrid to Lisboa (re-visiting some of the final 2003 sites) then with MA, a circular route from Prague, Czechia, through Bohemia. In 2016, I was back to 'only one' tour, late in the year through Istria, visiting parts of Italy, Slovenija and Croatia for a pleasant sampling of seafood and wine. I am very lucky that my life allows me to fulfill this dream of cycling. Be it on my shorter local jaunts, or my future tours wherever I happen to choose, I can't get enough, so I guess I'll just have to keep on going. SO, which tours are on 'The List' now? For a while now, Bilbao to Barcelona, Spain, have been beckoning. In 2018 I cancelled a tour along the Czech Greenways from Vienna to Prague. In my opinion, that is unfinished business which needs to be attended to. A return to UK also pops up - either Land's End to London, or Aberdeenshire, Scotland, from whence came the Irvines in the 1700s on their departure to Canada. There is so much out there to discover on two wheels - and the more I do, the more I want to do. I really don't know where the next trip will take me, but I can't wait to find out. OF course, the BIG trip approaches as my wee lad, now 13 years old, becomes increasingly comfortable on longer rides. 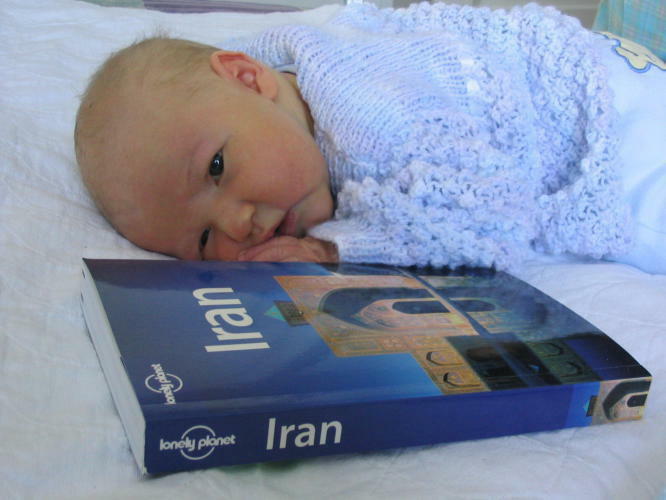 On the day he first came home from the hospital after he was born, I photographed him with a Lonely Planet guide book and told him, "When you get bigger, we're going biking in Morocco." I have repeated this to him almost every night at bedtime when I tuck him in. Thus, a new phase in cycling is fast approaching! Alex on the night he came home a few days after he was born. I thought I had photographed him with LP Morocco; obviously not. So I guess after Morocco we cycle Iran! OK - I'm up for that.